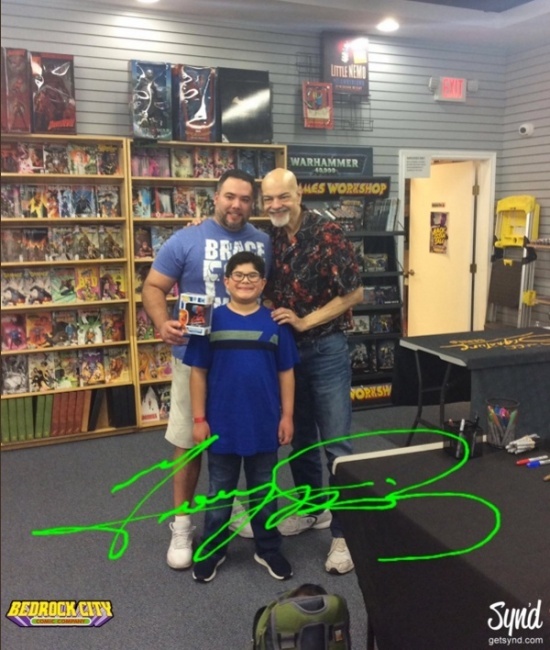 If you're going to have George Pérez, or any creator, really, in your store, you might as well max out the experience, right? That was the task that Tiffany Cochran set for herself. Cochran is the director of marketing for Bedrock City Comics, a four-store chain in Houston. Fortunately, Cochran comes pre-loaded with years of experience, having previously worked in promotions and events for Warner Music Group. Cochran took some of her music experience and added what she’s learned in the direct market to make Bedrock’s February 2018 signing with Pérez a top-flight event for the store. And she offered some tips and insights. Make Your Staff Competitive. Bedrock won the Pérez signing in a competition run by Hero Initiative. The store that raised the most money for the charity via a customer change program got Perez for an in-store. Cochran prepped the Bedrock staff, and insured that the individual store that raised the most would get Pérez in their store if Bedrock won. "I made sure all our employees were told to ask customers at the end of purchase if they wanted to add a dollar or more," Cochran says. "The store that did the best with that verbiage actually won." Bedrock made sure that the ask was only once per purchase so customers did not feel badgered. A register code to ring rounded-up credit and debit card purchases was also created so they could track that. The competition energized the staff, leading to a fun in-store environment. Cochran points out that certainly not every retailer has multiple locations, but internal competitions can be run by shift or even by individual clerk. Bounceback! Everyone at the signing got a coupon they could bring back to the store, and a rather specific one at that. "I felt like the people who were coming were comic book fans, not necessarily here for toys or merchandise," Cochran says. "So I wanted to give them something that would get them, specifically, back into the store." So Bedrock’s coupon was for 20% off on graphic novels, with a small twist. "I knew from the calls we were getting and poking around social media that people were coming from out of town," Cochran says. "So I wanted to make it something they could redeem and use from anywhere. So we included a code you could use to get the discount ordering from our website. It’s our chance to see a new face, so let’s make them a new customer." Sure enough, aside from Texas, Bedrock got people showing up from Oklahoma, Arkansas, Louisiana, and even Florida. Time Product to Event. Pérez considers himself effectively retired as artist. 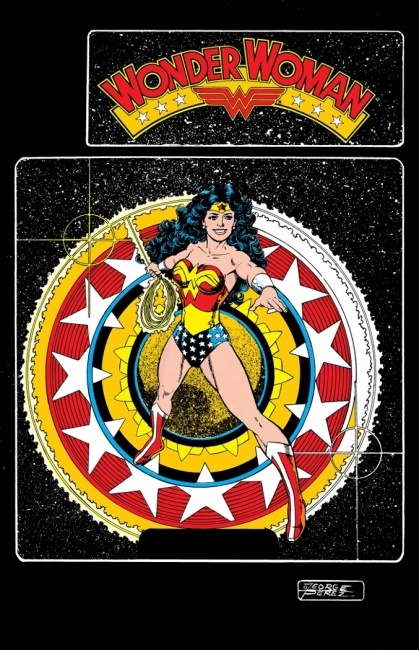 Still, he has a massive backlist, and Bedrock was able to key their event just after the release of a new Wonder Woman by George Perez Omnibus Vol. 3 from DC. Bedrock also made sure their customers wouldn’t be shut out. Control the Line. The "experience economy" comes with a cost: line control. 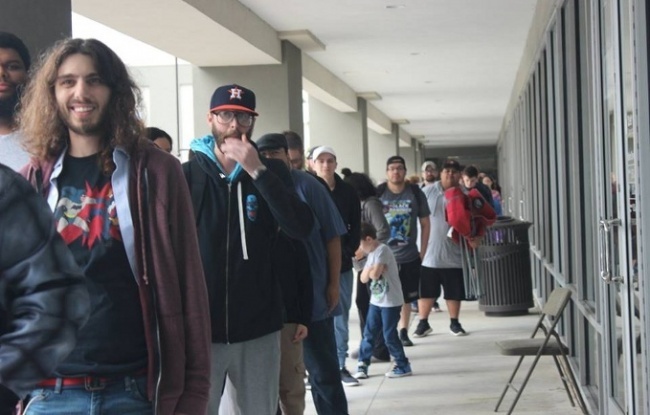 For a 2 p.m. Saturday signing, the first customer got in line outside at… 2 p.m. Friday. More people started lining up at 4 a.m. Saturday. "Lining up has become an event in itself," Cochran says. "We try to stop that as best we can. 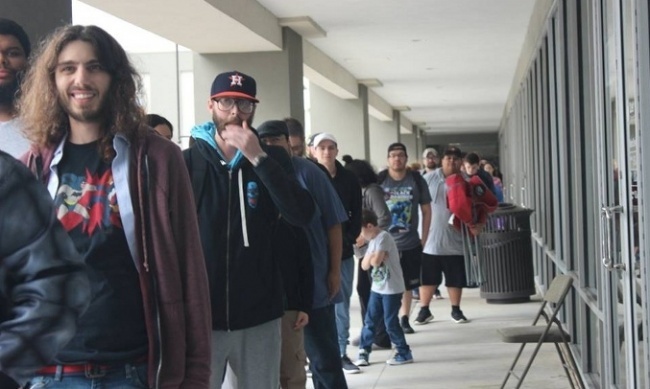 We said that everyone who was here at 8 a.m. will get a wristband, and you’re free to leave, and you can come back and line up according to your wristband number at 1:30. Otherwise… it gets in the way of normal business, and we don’t want people standing outside sweating all day." The event was a hit. Originally scheduled for four hours, it ran eight hours long, with George Pérez generously agreeing to stay until everyone was satisfied. 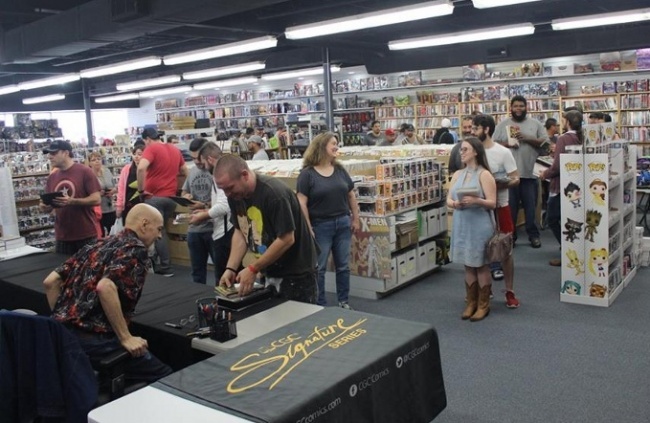 Click Gallery below for full-size pics of the signing!